The wines of La Jota have deep roots in Napa Valley. Back in 1888, winemaking pioneer W.S. 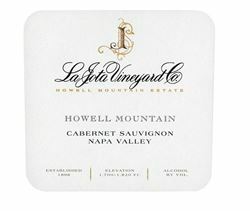 Keyes planted some of the first vines on Howell Mountain, and 10 years later his contemporary, Fredrick Hess, built a stone winery and established La Jota Vineyard Co., named for its location on the Mexican parcel Rancho La Jota. Both men won medals for their Howell Mountain wines in the Paris Exposition of 1900. Today, La Jota Vineyard Co. proudly carries on this great legacy with its small-production mountain Cabernet Sauvignon, Merlot and Cabernet Franc. All La Jota wines are sourced from the winery’s estate and from nearby W.S. Keyes Vineyard, and they capture the intense fruit and mineral complexity of these cool-climate origins.